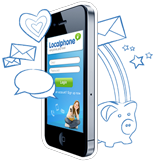 If you’re a student and new to Localphone you can get double credit on your first top-up, to a maximum of $10. Sign up for a free account and use your unique voucher code at the checkout when you add credit. and earn an extra 10% credit FREE. To be eligible for this offer you must have access to an academic email address containing .ac or .edu from a known university or college. We will email a voucher code which gives double credit up to $10 and is designed for single use. The voucher code will expire 30 days from the date that it was emailed. See offer terms.